Dr. René Jacobs was trained in biochemistry and molecular biology at both the Memorial University of Newfoundland and the University of Alberta. In 2009, He was appointed to the Department of Agricultural, Food and Nutritional Science at the University of Alberta. 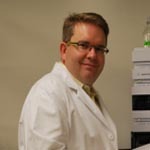 Dr. Jacobs’ research program incorporates “state of the science” in vivo techniques, biochemical analysis and nutrigenomics as part of a comprehensive, multidisciplinary approach seeking to understand the complex interactions involved in the etiology of obesity, T2DM and other chronic diseases.